Wisconsin drivers would finally earn the right to have a car damaged in a crash repaired wherever they want — not where an insurer wants — under bills being considered by the Legislature. It surprised us that any state at this point didn’t have the “right-to-pick-a-shop” rule; it’s very common, though recent measures like this one have sought to remind customers that it actually exists. “I don’t know if we’re the last state,” Wisconsin Auto Collision Technicians Association Ltd. Administrator Sue Peterson said Monday. Assembly Bill 119 and Senate Bill 93, which appear to be identical, would expand a current ban on insurers mandating a particular auto glass shop to any repairer. “The bill provides that, for purposes of the prohibition on insurers from requiring insureds to use a particular repair facility, a consumer has the right to select the motor vehicle repair facility of his or her choice,” the Legislative Reference Bureau wrote in an analysis of AB 119. Peterson said insurers have said the “right to choose” has existed for years, but there’s no state law, and “occasionally — not real often,” the issue comes up. Peterson said policyholders will call her asking about state law. “When I tell them there isn’t one, they back down,” she said. The bill would “give them the ammunition that they need to stand their ground,” she said. The bills also would make it illegal for an insurer to drag their feet on a claim because of the shop selected. “No insurer may fail to initiate or conclude with due dispatch an investigation of a claim for repairs to a motor vehicle on the basis of whether the repairs will be made by a particular contractor or repair facility,” AB 119 states. The auto glass industry has had these protections “for quite some time,” Peterson said, but collision repair has so far been out of luck. “We’ve been working on consumer choice for years,” she said. Customers (and some collision repairers) might still be out of luck if they just took out or renewed coverage — the bill will let insurers pick those customers’ auto body shop until it’s time to renew the policy again. The bill has been sent to the Senate Committee on Insurance, Housing, and Trade and Assembly Committee on Insurance. It has bipartisan sponsorship in the Senate, and while the Assembly sponsors are all Republicans, they include some of the party leadership (Majority Caucus Sergeant At Arms Samantha Kerkman, Assistant Majority Leader Daniel Knodl and Majority Caucus Chair John Murtha). So that could mean its odds of passage are good, though a more or less identical version of the stripped-down bill didn’t make it to at least one chamber’s floor last sesson, according to Peterson. 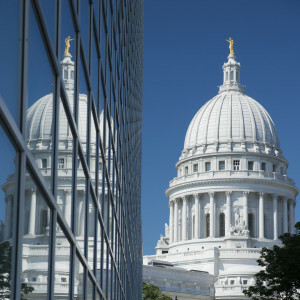 The Independent Insurance Agents of Wisconsin and Professional Insurance Agents of Wisconsin haven’t taken a stance yet. Be heard: Wisconsin legislator contact information can be found here.